In post-Roman Britain, small, well-worn and excessively clipped Roman bronze pieces bearing the heads of unrecognised dead emperors may have functioned as localised currency, or tokens perhaps valued by weight, when the first Saxon tribes arrived, intent on permanent residence, in the late 5th century. Many of the boatloads who landed on our southern and eastern shores had embarked in Continental areas occupied by Frankish, Merovingian and Burgundian tribes already striking their own post-Roman gold coins. Trade with their blood kinsmen in what became England carried gold pieces across the Channel and soon generated locally made copies, probably struck in mints at London and Canterbury. When economic difficulties on the Continent obliged Frankish kings to move from gold to silver money the tribes in England had to follow suit. Their small silver issues, known as sceattas (meaning wealth) featured a wide range of designs including crude imitations of late-Roman coins with a bust on the obverse and a half-recognized Roman standard on the reverse. Inscriptions, if present, often used runic letters. Over time some of the human busts evolved into animalistic shapes including porcupines, birds and mythical beasts. Later, pictorial elements included shields, portrayals of the god Wodan, quadrupeds and dragons. Crudely engraved human figures such as archers and churchmen holding crosses also made appearances. A fresh development on the Continent in the 750s introduced the denier in the lands ruled by Charlemagne and his successors. The coin was broader and flatter than a sceatta, with surface areas big enough to permit large lettering, as well as a pictorial design. The name of the coin, abbreviated to d, gives us the same letter in £sd where it stands for denarius (English penny). One of the first rulers in England to issue a silver penny of similar dimensions was King Offa of Mercia (757-796). 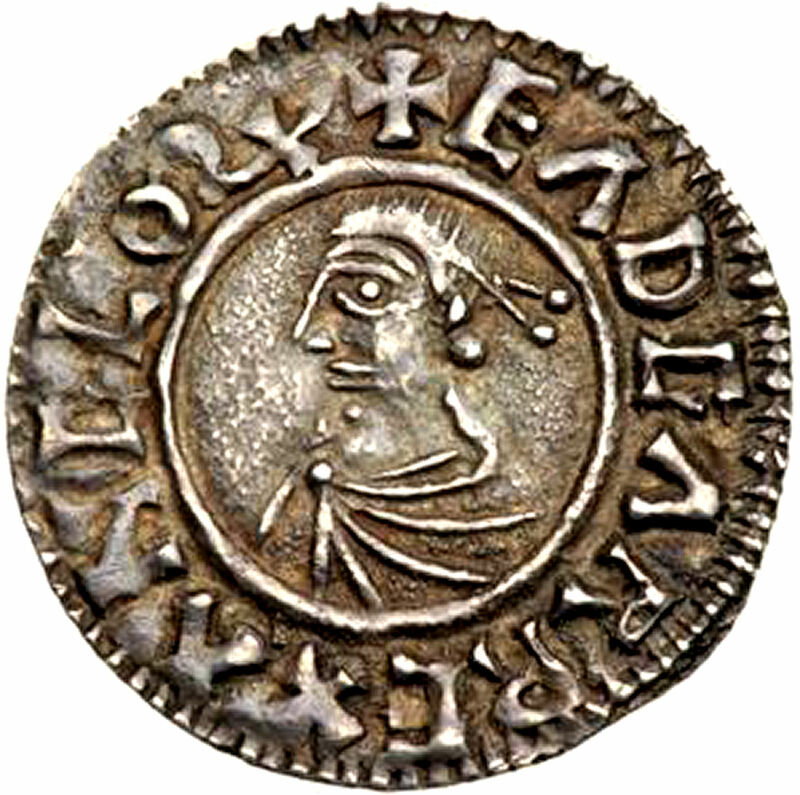 Some of his earliest pennies display a right-facing bust and the legend 'OFFA REX' in large letters, with the name of the moneyer who guaranteed the coin’s weight clearly inscribed on the reverse. This coin possessed all the elements that appeared on English pennies for the next five hundred years. Monarchs of other English kingdoms – Kent, East Anglia, Wessex, Northumbria, as well as Archbishops of Canterbury and the Danes who temporarily seized much of East Anglia – all issued pennies. Eadgar (959-975) was the first king to be crowned King of All England. (Other monarchs had claimed the title, but Eadgar was first to take the crown in a coronation ceremony.) It took place at Bath Abbey in 973, delayed until late in his reign because womanizing in his youth had angered his archbishop. Not long after that year silver from newly discovered mines in Saxony flooded into England for purchases of English wool. Eadgar took the opportunity at that time to strike what became known as his Reform Coinage. Its penny carried the obverse legend 'EADGAR REX ANGLO RX' around a central circle which enclosed his diademed & draped bust facing left. Eadgar was aged just 32 when he died and was buried at Winchester in July 975. 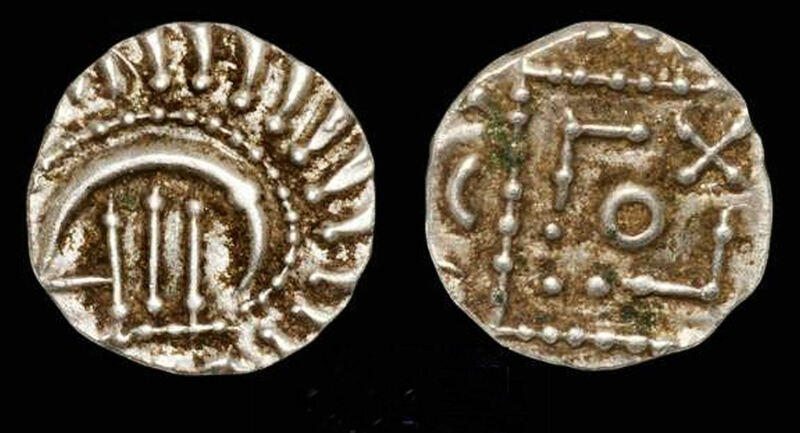 Coins of similar type were issued by subsequent Anglo-Saxon monarch until the arrival of the Normans in 1066.